There was a time when the name Pan Am was an icon of sophisticated international travel. Now, the world headquarters of the once-mighty airline is in Dover, N.H., in a warehouse toward the back of an industrial park. The airline was shut down years ago, but its name may be on the brink of new fame. A new primetime television show called "Pan Am" is now on ABC, and Pan Am Brands is poised to take off with it. 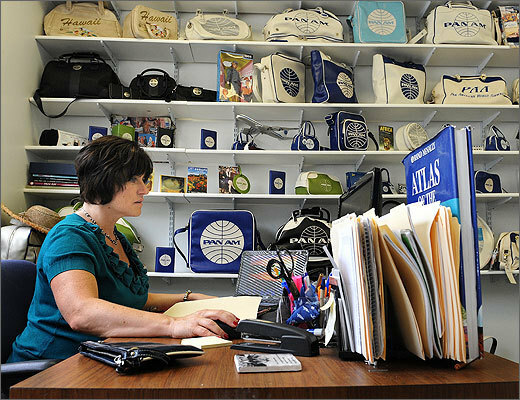 Left: Lisa Morrow of Lebanon, Maine, is global sales manager for Pan Am Brands based in Dover, N.H.